H.E. 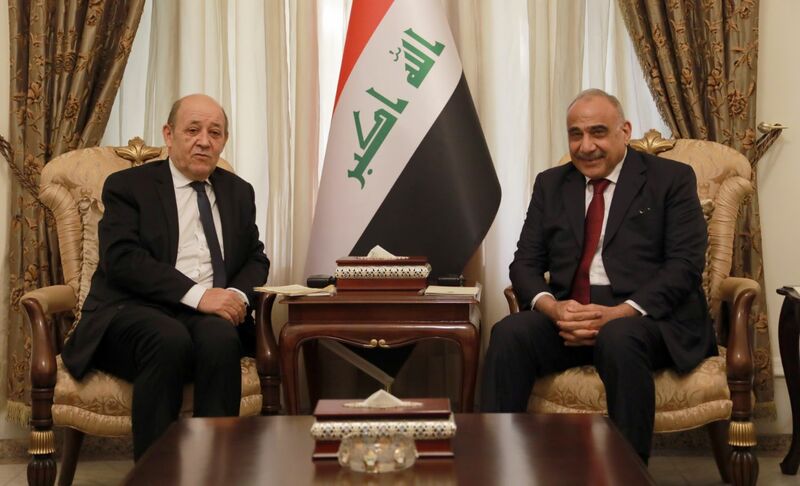 Prime Minister Adil Abd Al-Mahdi: France is a friend of Iraq and the relations with it are very important. His Excellency Prime Minister Adil Abd Al-Mahdi confirmed that France is a friend of Iraq and the relations with it are very important for its position, strong and distinctive role, We look forward to a greater contribution, presence and cooperation in the fields of economy, services, culture and education in continuation of France's position with Iraq in its war against Daesh, while continuing coordination and communication on supporting for security and stability in the region. His Excellency said during his meeting with French Foreign Minister Jean-Yves Le Drian today, that the democratic experience in Iraq is strengthening and making progress for all Iraqis, and that Daash is not Iraqi made, but it is manufacturing of a backward and extremist idology, calling for building balances that support moderation, centrality and civic values, underscoring His Excellency keenness to develop partnership relations with France in the fight against terrorism, construction projects and reconstruction, His Excellency also expressed full readiness to overcome obstacles and red tape. His Excellency Prime Minister commended France's position on the cancellation of debts owed by Iraq through the Paris Club. His Excellency Prime Minister put forward a proposal for a twinning deal study between the cities of Paris and Baghdad. The French side welcomed it and promised to study it. The French Foreign Minister underscoring that we came to declare our full support for Iraq, its government and to express France's will to expand relations with Iraq, we will continue to stand by Iraq in the construction after our support in the defeating Daesh and support of Iraqi forces. The French Foreign Minister added: Iraq has become a key player in stability and its policy based on the exclusion of conflicts and the preservation of sovereignty and national decision, while France will move forward the relations of partnership and cooperation with Iraq and support the Iraqi government, which leads to Iraq successfully, referring to the expected visit of French President Macron to Baghdad to reaffirm support and develop the friendly relations, cooperation and partnership existing between the two countries. During the meeting, they discussed the situation in the region, means of supporting stability and combating terrorism.